This family history begins with Ann a runaway slave from Kentucky, who ran and walked a long chilling and desperate journey until she reached Chillicothe, OH. Once there, she was befriended by the Walker family, (Quakers). She felt safe there finding freedom and peace. Can anyone imagine being a girl all alone traveling in such conditions? In about 1832, the Walker family lost Mrs. Walker and all the burden of the house upkeep including cooking rested on Ann. But she was happy to oblige since she was being paid and freedom never tasted so good. The next year was like the last; peaceful and busy. Ann met George one spring day as he came to see if there was work. After another long winter and into the spring George asked Ann to be his. Finally, in 1834, George and Ann welcomed a daughter and named her Margaret after her mother and two years later a son was born, she named him William Parker in memory of the father and brother she would never see again. As long as they remained on the farm of the Quakers, they all felt safe. Ann being very fair and her children even fairer in complexion and features were all assumed to be Quakers too. Years went by and Mr. Walker passed away and in his will he left everything to his eldest son and a small plot of land and house for George and Ann and their kids. George and Ann decided to take their family further north to Canada to the Elgin settlement that William had told them stories about. William Parker by this time was grown and gone off to be a seaman on the Great Lakes. By June of that same year, they packed up and looked north taking with them the good wishes and prayers of those left behind. The Walker’s arrived in the Elgin settlement in about 1860. William Parker Walker (b. 1836-1931), began his travels as a seaman on the ships traveling the Great Lakes. Along the route was a port at Windsor, Canada; it was during a layover there that William P. learned of the Elgin settlement in Buxton. The plight of the runaways struck a chord with William P. and from then on he quietly helped runaways to cross over to Canada at different stops along the way. In fact, he helped his parents and sister leave Ohio headed for Buxton. William P. was an educated man in knowing how to read and write and was trained by his father in the Coopers Trade (the making of wooden barrels). He had a thirst for knowledge and energy abound. Once realizing his place was on the land William P. left the sea to farm the land offered in the Elgin settlement. and became the 2nd Post Master of the settlement. Additionally, he was the librarian of the school and the Secretary for the B.M.E. Choir. 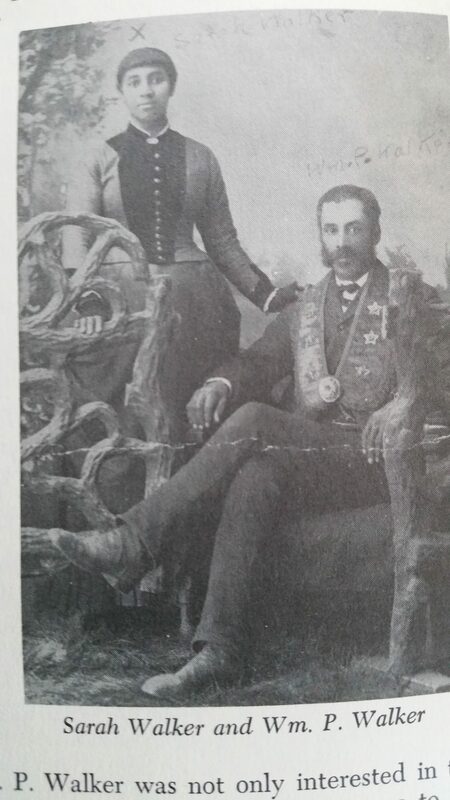 As 1870’s approached, William P. Walker met and married Sarah Kersey they were living and farming just outside of Brownville, Nebraska on land he awarded back in 1860 (under the Script Warren Act of 1855) and they ultimately had six children.